Julie: Today Emma and I are talking about two MSCL episodes. The first one is all about Brian Krakow. THE Brian Krakow. We have a lot to say about that one. The second episode, “Self-Esteem,” seems to come out of nowhere. As you know, I never watched a minute of this show before we started reviewing it for This Was Television. 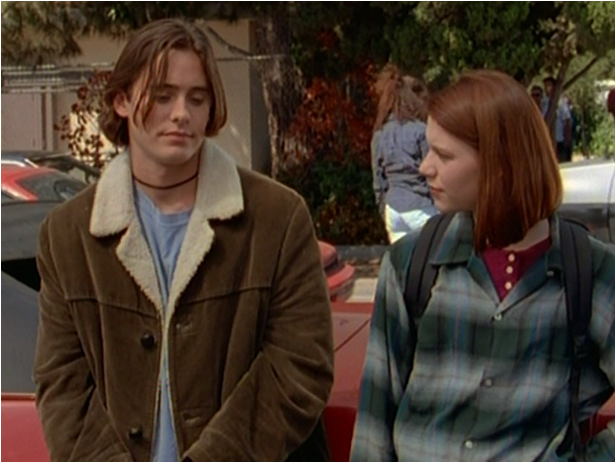 Based on what I had heard about My So-Called Life from my friends and from the general population, I always thought it was a show about Angela Chase and Jordan Catalano. But as far as I’m concerned, Jordan is probably the least essential character on the show. Watching the show now, nearly 20 years ex post facto, I view the show as an all-grown-up Angela Chase. And I think Jordan is just a stopgap in Angela’s life. He’s the mistake she has to make in high school. So that she can eventually end up with Brian Krakow. Or Rayanne. But probably Brian Krakow. The first episode this week, “Life of Brian,” takes us into the mind of Angela’s future husband. Brian is the yearbook editor and a super-duper smarty and he does all the things and whine whine whine. He also looks into Angela’s window with a telescope, which is gross. But it’s Brian Krakow, so I’ll allow it. Sharon is organizing a charity dance for happiness or something, and everyone is concerned about with whom they will go. Angela wants to go with Jordan. Jordan wants to go with no one. Brian wants to go with Angela. Rayanne wants to go with her flask, with whom she has recently parted ways. And Rickie wants to go with a guy who looks like a young James Marsden in hipster glasses. It’s a giant clusterfrak of disappointment. Brian ends up asking the cute girl who actually likes him, but then ditches her when Angela swoops in (WTF was she doing?) and he thinks this is Angela’s way of telling Brian she’s in luuurrrrve with him. Angela runs into Jordan who kind of blows her off. Rickie and young hipster James Marsden have a moment, before Rickie realizes that Jimmy Mars-Mars is more into Rayanne than he is into Rickie. No one has fun at the dance, as no one ever has fun at high school dances. The way they handled Rickie’s storyline was really thoughtful and sweet and tragic. I remember as a girl in high school, how I never knew what the guys were thinking and whether they liked me or whether they (more likely) even knew I existed. To throw being gay into the mix, when you’re probably the only kid self-actualized enough to understand your own sexuality and you have no idea how your affections will be received, is just a whole other beast. Emma: Yes! THE Brain Krakow episode and the switch-up of having Brain get the Angela-style voiceover works particularly well. It also highlights that Angela can get away with saying wistful things about the minute details of someone’s hair or clothes as it sounds more ridiculous coming from Brian. This is probably because Brian is generally more awkward than Angela and even his thoughts sound as unaware as he does in his normal dialogue and in my notes I have written the word “awkward” far too much, but it’s definitely the running them of the episode. This theme is perfect for an episode that focuses on a school dance and all the misery that something that should be fun brings. When it comes to dances (or school discos, as we call them over in the UK) there are a lot of rituals that are different in my experience between the US and the UK. Firstly, we never had the whole asking someone to the dance dilemma, it just wasn’t a thing. You would usually go with your friends and worry about who you would dance with when you got there (or the hours that you spent shopping for the perfect outfit/getting ready) and so it always confused me in U.S. shows/movies with the whole fretting about who was going to ask you/whether you should go stag debate. So while I have never done a Brian and gone for a better date option, I did do something kind of awful and go out with a guy because I liked his best friend—a tactic that is so never, ever, ever (channeling my inner TSwizzle) going to work and surprisingly didn’t. Yep, I am the worst. So while I didn’t have the build-up to who I was going to the dance with, the episode captured those painful sitting around moments, especially as the slower songs were being played. The best moments of these events were always the songs where everyone could pull a Rickie and let off some steam and the songs that usually did this were things like “Jump Around,” “Smells Like Teen Spirit,” or “Boom! Shake the Room.” This moment with Rickie is so wonderful because it is the first moment that it feels like he just lets go and feels happy with who and where he is. What are the songs that define your high school dance experience? As you said they handle the Rickie storyline in such a thoughtful way, and it really gives Wilson Cruz a moment to shine as he normally gets to play the understated moments of sadness. I think that Angela really believes it when she knows exactly how Rickie feels, but how can she? Comparing what he is going through to her Jordan Catalano situation is naïve on Angela’s part and I think the show does a terrific job of portraying the alienation and difficulties of being gay in high school. I get what Rayanne is trying to do with young hipster James Marsden, and she has the best intentions, it’s just that Rayanne doesn’t look at the big picture when it comes to Rickie and how things are different for him. Rayanne doesn’t appear to be all that changed by her stomach pumping experience and I totally forgot that this had even happened until she mentioned her session with the counselor, but Rayanne really isn’t one for wallowing in the past (unless it can get her out of class). From what I can tell about this dance it was just a random one, with a Sharon invented theme rather than a big one like Homecoming and so the clothes are more casual than prom. I loved the crushed red velvet dress with the flared sleeves that Angela is wearing and Rickie of course killed it in his blue blazer (nice touch with the fancy red ribbon that he had on his jacket) and standard fancy waistcoat. Brian looked like, well Brian but with a suit jacket over his plaid and young hipster James Marsden tried to pull off the glasses, scarf and Kangol looking hat. The one school disco outfit that I can remember was this black satin wraparound skirt that I thought was the best with a green and white checked vest top that I thought looked incredible. What was your best dance outfit? I’ve got more to add about Brian, Jordan and the Chase’s wallpapering situation, but I will leave it there for now. The whole “asking people to a dance” thing is so awkward and stupid, really. Would you rather go to a dance with someone you barely know and possibly barely like than with a group of your good friends? Of course, there was always the chance that the dance would end up magical and romantic and fabulous, but do you know how many times I experienced that fairy tale dance during my four years of high school? Exactly zero. And nowadays there’s even this pressure for the guys to ask the girls to prom in these elaborate ways that rival wedding engagements. You know how I was asked to prom? In the library during free period. He asked if I was going with anyone. I said no. He asked me to prom. And I still remember it even though it didn’t happen on a scoreboard at Wrigley Field. Also, I have no recollection of dancing to any song at any dance except, for some reason, “Come on Ride the Train” by the Quad City DJs at senior prom. And I don’t actually remember dancing to that song, just that they played it. Maybe there was a lot of of Rusted Root’s “Send Me on My Way”? I have a vague recollection of that. I recently read an article on After Ellen about how Rayanne was so obviously into Angela in a sexual way and now I can’t un-see it. I thought this back a few episodes ago when her mom was gushing to Patty about how much Rayanne talks about Angela. It’s kind of interesting when you think about it. Rayanne is best friends with someone who is so true to his own sexuality and Rayanne, who seems to be really in touch with this part of herself, may not be as evolved or self-aware as she thinks she is. We haven’t even touched on the wallpaper yet! I think I literally had that wallpaper in my room from 1988-1993. I’m not even kidding. I even picked it out myself. What was fourth grade me thinking? I absolutely love Graham and Brian together and I look forward to the day when Graham invites Brian over to help him make the perfect risotto to impress Angela. What thoughts do you have on Jordan? Angela thinks it’s the foxiest thing ever that he doesn’t like to make plans, but neither does Brian, and for some reason when Brian says it, it doesn’t make Angela all hot and bothered. Emma: Brian helping with the wallpapering totally made up for that time he didn’t help with the gutter problem and even though I thought those scenes were brilliant, there’s also something icky about asking the dad of the girl you like for dating advice. The fact that we have only heard and not seen Brian’s parents feels significant as they sound pretty detached. The Chase household is completely different, there’s a lot of love and conflict and you can see by the amount of times he drops by with self-confessed made up reasons (I mean a borrowed Atlas, come on!) that it might not just be Angela that he wants to see, it’s the warmth coming from Angela’s family. It’s also hilarious though that they can all see through Brian’s lies about Delia and the dance and that Patty and Graham share a good laugh amidst a fight over this moment. It’s like they already know that Angela is going to have the worst time. It seemed strange to me that Jordan even showed up to the dance as he really doesn’t seem the type to indulge in such high school rituals, but maybe even he wants some memories, or something like that. His vagueness about making plans comes across as lame now, but to Angela (and teen me) I’m pretty sure it reads as enigmatic. I like that they had this conversation by his precious car and his lack of commitment to anything Angela related makes the start of the next episode seems out of the blue (but more on that later). When Angela and Jordan have their brief moment outside the dance he just gives her something else to obsess about by asking her “How are you like this?” Angela is perplexed by this and you know that she will be asking herself “How am I?” for the foreseeable future. Jordan is still a really hard character to read and while the next episode addresses some of this he does remain a shell of a character. The repeated phrase of “whatever happens, happens” is also uttered by Graham in one of the conversations with Patty and it’s one of those sayings that can either seem like you’re not trying to own the moment or that you’re not fussed about an outcome (am I being to harsh on this phrase?). I love that Angela has such opposing reactions to Brian and Jordan, but only in that it shows how much she will worship anything that Jordan says and will quite happily rag on everything Brian utters. That Rayanne theory sounds interesting and I’ll have to read it as while it sounds like it could apply, I’m not entirely sure I buy it. It could lead to an interesting turn in our Sharon/Rayanne fanfic. Speaking of which we have much Sharon/Rayanne epicness to discuss in the next episode. Those dance outfits sound amazing and I’m glad you’ve still got them—it’s all about the ’90s at the moment after all! Julie: I guess we have to talk about Jordan now, don’t we? I actually had to get off my couch and check the DVD case to make sure I didn’t skip an episode. Angela and Jordan are making out in the boiler room? Say what now? When did that happen? Also, I feel cheated out of seeing how this actually went down. I guess I assume that Jordan left her a note in her locker or something, but I want to see what happened the first time they met in the basement. Voyeurism! Why else do we watch television? I thought this was a really strange episode for several reasons. First, Angela and Jordan are inexplicably making out. Then there’s the random girl in class who gets good grades except she doesn’t want her boyfriend to know she gets good grades and then they really never go anywhere with that, do they? I mean, she and Angela have a study moment in the bathroom (it was in the infamous bathroom, right? ), but that’s kind of it. There’s no big “and this is why you should never change yourself for a guy” lesson. And then the Graham culinary class storyline was a little off, too. 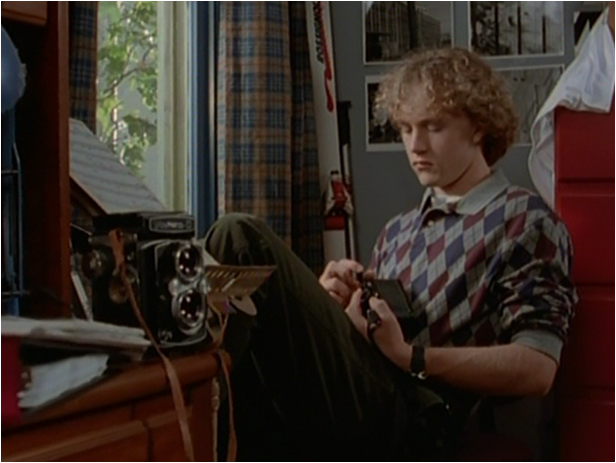 It was obvious from the time Patty signed him up for the classes in the previous episode that Graham would wind up teaching, so I’m not sure why they took so long to get to that inevitability. And that lady in his class was just obnoxious. What else do I have to complain about here? Oh yeah, did Sharon and her boyfriend break up at some point? One minute Angela and Rayanne are talking about Sharon and Kyle holding hands and then the next minute she said she dumped him. This coupled with the Angela and Jordan stuff makes it feel like we missed an episode somewhere. Emma:I’m with you on how abrupt this episode feels and it does seem like there is one missing. It’s really jarring that we have gone from lingering looks from Angela and occasional awkward conversations with Jordan to heavy making out sessions. They have kissed before, but it was never like this and it does feel like we’ve been cheated out of development scene or two. Maybe they want to show that Angela will drop everything to get this opportunity with Jordan and that’s why they didn’t feel it was necessary but it certainly feels out of the blue for something that they have been slowly building to. Whatever positive feelings I had for Jordan (and as you know I used to have many) are completely gone now and even though Jordan took the “huge” step and helped Angela’s hand at the end, it still doesn’t make up for how he treated her throughout the episode. The pool table scene was especially icky, Angela lied to Rayanne and Sharon about Jordan inviting her to the gig and it’s extra awful because they’re watching the whole disastrous interacting. Claire Danes once again shows her amazing chin and crying skills and this scene is really heartbreaking. Angela does get one dig in with Jordan telling him she spells her name with one ‘L,’ which is rather cutting considering she knows about his reading issues, but he’s been a jerk so he deserves this moment. It’s all Angela has in her arsenal against Jordan and she’s vulnerable in all other things Jordan Catalano related. I’m with Sharon and Rayanne in feeling concern with this whole situation as it looks like Angela is in danger with getting hurt, hand-holding or no hand-holding. So Sharon is single and this felt less out of the blue than the whole Jordan/Angela stuff but mostly because of how Kyle was in the previous episode where he was less than forward in asking Sharon to he dance (though in his defense do you really have to ask your girlfriend to the dance?). I think it gets mentioned in the opening sequence that Sharon is now single too. Of course I loved the whole Sharon/Rayanne dynamic and that they discussed their concern in the infamous bathroom (the very same one as Angela’s study session) and the reaction to Sharon knowing who Buffalo Tom* are is pretty hilarious. I think it’s safe to say that Rayanne and Sharon are friends, even if they say they’re not. *This continues the trend of real bands appearing in teen shows and I wonder what was the first show that did this? And what about Enrique? The new teacher isn’t as much of a cliche and I’m glad that someone has seen that Rickie has potential as he strikes me as the kind of person that Angela describes as sitting in the back and staying unnoticed. Though I would probably getting just as annoyed by the excessive pausing between remarks from the new English teacher (is this position the My So-Called Life version of the Dark Arts teacher from Harry Potter?). Rickie’s complaining to Brian is overly theatrical as his impression to Rayanne so it is clear as to why this teacher thinks Rickie should be on the stage. Brian also vents to Rickie about Angela and neither one is listening to the other, but I like their relationship and I think that it is good that they both have someone to complain about their lives to. Not sure the teachers attempted flirting subplot works as it seems slightly random, but perhaps it’s to show that teachers like students have self-esteem issues like the pupils do. What did you think about the new teacher? With Graham I’m glad that he is finally doing something he loves but it did feel slightly off, particularly his interactions with Patty. I get why he would get annoyed by Patty thinking that there was something up with him in the class, but the manner in which he didn’t tell her the whole story and let her dig herself a bigger hole felt a bit unfair. Julie: I’m going to go out on a limb and say that the first band to appear on a teen show was Color Me Badd on Beverly Hills, 90210. Because I want that to be a true fact. A Harry Potter/MSCL connection, I love it! The English teacher position at Angela Chase High is cursed. That new teacher is probably just Voldemort on polyjuice potion. I’m actually rooting for the new teacher to survive because he’s played by Meredith Grey’s dad (Second Grey’s Anatomy reference today! You won’t find that anywhere else on This Was Television!) and he looks like a slightly older Jeremy Renner. You asked for my hard-hitting analysis. As a former teacher, I really felt for him. Teachers do have self-esteem issues. We want people to join our clubs. We latch on to the kids whom we find most responsive. Having been both the teacher and the student in that situation, I get it, and I’m glad that Rickie has decided to be a joiner. Hopefully Rayanne will follow him because she’s total theater material. If this show had aired in 2012, would Graham be competing for his own show on Food Network, like the great Guy Fieri? I shudder to think.